Virtually all businesses running enterprise resource planning (ERP) solutions - like SAP, Oracle, JDE, Microsoft Dynamics, PeopleSoft -- want to move to electronic delivery of customer invoices. The advantages of electronic invoicing are clear: It's faster, less expensive and more reliable than manual invoicing, and it takes the inefficiency of paper out of the process. 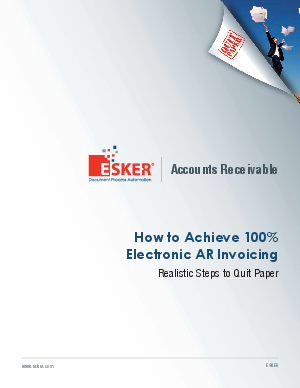 Electronic AR invoicing addresses a broad range of issues including operational cost control, limitations of built-in ERP capabilities for process automation, mailroom and mail house difficulties, and billing dispute management. And by increasing the speed and accuracy of invoicing through document process automation, organizations can collect cash faster because invoices are delivered sooner.